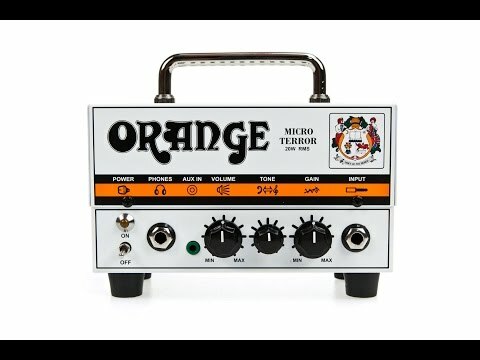 The Micro Terror from Orange is a tiny little 20w guitar amp head which just rocks! Loaded with a pre amp valve it has those classic tones and surprisingly, it's really loud! Whether you want to use it at home, at band practice or even at a gig it can handle anything you throw at it! It can even power a 4x12 speaker cabinet for that huge sound! From cleans to drives to full on metal it can do it all! The ultra portable size and design makes it easy to put in your car or backpack. With 3 simple controls it's pretty much 'plug and play', turn it up, add some gain and tone and you're away! If you want to play along to your songs then you can just plug in your MP3 player and jam away! Even link up your headphones for those private, silent sessions! Simple but effective! This mean little amp is for sale with FREE next day UK delivery so you can be jamming in no time!